The announcement that Hans-Joachim Stuck is moving from BMW to the Volkswagen Group as their Motorsport Representative has sparked some speculation that this is preparatory to VW/Audi entering F1. The connection is, of course, that Stuck raced in F1 in the 1970s. Never mind the Schumacher brothers, if Germany has a GP racing family, it has to be the Stucks. 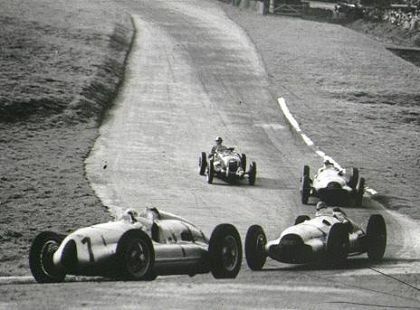 Hans-Joachim's father, Hans Stuck, became famous in the 1930s driving the fierce and over-powered Auto Union Grand Prix cars, winning several races in the process. It was no mean achievement; although the Ferdinand Porsche-designed cars pointed the way to the mid-engined layout of the future, the suspension arrangements were primitive by today's standards and the Auto Union gained a reputation as extremely difficult to drive quickly. Only the great drivers of the day, such as Bernd Rosemeyer, Tazio Nuvolari and Stuck himself, could handle the beast and their struggles against the W125 Mercedes became legendary. So it is fitting that Hansie's son should eventually find his way back to his father's old firm, Volkswagen having bought the Auto Union Group, including the Audi name, in the sixties. Memories are revived, hopes rekindled - surely this is significant. Perhaps Bernie is going to have his dream come true and see Audi enter F1. Unfortunately, these connections omit the fact that Hans-Joachim raced in many other types of car apart from his 81 Grands Prix. If anything, he was more of a touring and sports car driver than an F1 star; certainly, he had plenty of success in other types of racing, whereas his time in F1 was spent largely in the wrong teams at the wrong times. He was good enough in the wet to earn the nickname "der Rainmeister", however. There is no reason to suppose that Stuck's appointment is a fore-runner to VW/Audi's entrance to F1, therefore. Their expertise in modern times has been centered on sports and touring car racing and Hans-Joachim's credentials fit well enough with that. It remains unlikely that the firm will return to GP racing. Even so, we can still dream. With the other two large German manufacturers already heavily involved in F1, the addition of VAG would be the icing on the cake, a promise of a repeat of the mighty struggles of the 1930s. It is no wonder that Stuck's move is being seen as significant - we want it to be so! After what this sport has been through in the past couple of years, I think he would be smart to avoid it at all costs. As much as I would love to see them it just doesn't seem worth the hassle, look at Toyota. Does anyone see Renault moving a few miles east? With all that is going on at Renault, if VW were to buy into F1, wouldn't Renault be the perfect buy? Would the fine, if there is one, be factored into the price? It's an interesting thought, Dan, but I don't know if Renault could bear the embarrassment of selling up to VW. Surely it would be easier just to pack up and go home - tells the FIA what you think of them too. Renault might not get much choice. It is obliged under the FIA regulations to run its entry, or to ensure someone runs its entry, until 2012. I've heard about the Mechachrome theory, but I don't know if it would fool the FIA. If it involves pleasing Bernie, they would probably be motivated to prevent Renault's engine supplier from taking over the chassis entry. In which case, Renault would have to sell to someone to meet its FIA obligations. It makes a lot of sense for VW or any other manufacturer to be looking at moving into F1 now. When I first heard of the planned 10 year engine freeze my first thought was that if I was running VW, GM or any other major manufacturer I would plan to enter F1 in 3 or 4 years having spent all that time working on engine developments. Assuming they do the job right they will have a built-in advantage for 6 or 7 years. If they buy Renault they get up to the minute chassis, aero, systems etc and they get the advantage of an in-built engine advantage. There has never been a better time to be the new boy in F1. Let the politics and chaos commence. Interesting. But would Renault feel bound to their agreement with the FIA if fined to the extent that McLaren have been? I'm pretty sure they'd get out, whatever the terms of participation in F1 are - and let the FIA decide what they want to do about it. As for VAG, they have said repeatedly during the last forty years or so that they are not interested in F1 and that makes it hard for me to believe they've changed their minds. The engine freeze does extend the possibilities for a new manufacturer to enter the sport in the next few years but I wonder how reliable that freeze will be. Ten years? I doubt it - the FIA will change their minds yet again long before the time is up. A small diversion from the text but your photo brought back memories that few will remember, don't forget I'm an "old dinosaur". Look at that photo, that's REAL racing without any MadMax restrictions. About 1985 I had the opportunity to sit in a Mercedes-Benz W-163 ........ just sitting there in the blue velour seat sent chills up my back. The steering wheel, about 18 inches in diameter, caused ones elbows to swing outside the cockpit nearly scraping the rear tyres!!! Two stage super charging through a pressurized carburator, mind boggling, no limits engineering but the simplicities of a sight glass in the rear fuel tank to warn the re-fueling crew when the tanks were topped up. If that was simplicity what were the twin 4 inch flexible hoses runing through the cockpit connecting the front and rear tanks. Modern day F1 fans can hail Schumacher as a 7 time champion but he won all that without an ingredient required in the 'golden' days of motorsport.......COURAGE !! !